If you’re looking to get a drone on the cheap, the best place to start your search is drones for sale on Amazon? This biggest of marketplaces places a huge emphasis on keeping margins extremely low – meaning, you’ll always find the cheapest prices for items being sold on Amazon. Let’s get started with our list of drones for sale on Amazon! Without a shadow of doubt, this is the current top seller drone for sale on Amazon. This is selling like hot cakes. 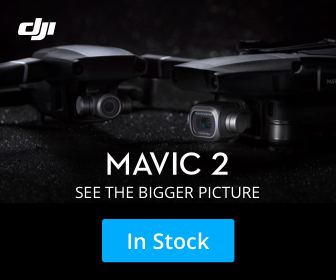 DJI, in fact, was not able to produce enough Mavics to meet the demand. Estimates are that DJI has sold about a 100,000 of these drones … but the numbers could have potentially been much higher had they had enough production to meet demand. We’ve already performed a full DJI Mavic review here, but let’s go through the highlights of our most preferred of the drones selling on Amazon. The Mavic’s main selling point is its compactness vs it’s feature set. Drones of its size are typically much less equipped – the Mavic’s foldable design ensure the drones is small and portable, yet packs a punch it terms of the camera and other essential features. If you are afraid of crashing your drone, you don’t have much to worry with the Mavic, it’s got built-in obstacle avoidance software which is able to detect static objects which is will then automatically avoid. You’ll find plenty of sellers of the Mavic on Amazon, so here are a couple of our favorites. The first is a bundle which includes the Mavic and a bunch of other essential features such as the DJI Osmo Mobile. If you’re still not much into drones and are looking to get started, one of the cheapest drones for sale on Amazon is the Cheerwing Syma. In fact, it’s one of the best selling drones on Amazon, primarily for this reason – anybody who wants to get used to how to fly a drone and wants to experiment without possibly crashing their expensive drone, typically goes for the Cheerwing Syma. Although the Cheerwing Syma is small and cheap, it still packs a bit of a punch. Here are few features of the Syma you might want to know about from the Amazon drone. Headless/IOC function – typically, when flying a drone, the forward direction of a quadcopter is the same as the nose direction. By using Headless/IOC, the forward direction has nothing to do with nose direction. This lessens the steepness of the learning curve and allows the pilot to enjoy flight while slowly learning each specific orientation of the quadcopter. Smartphone integration – Wifi FPV allows you to view photos & video while flying, the Syma also supports any IOS and Android phones. Stunts – The Syma is able to perform drones stunts. One key 360° rolls, continuous roll for perfect action and wonderful performance. Have a look at the Syma from the following best-selling drone on Amazon. The DJI Phantom drones are one of the main reasons for the consumer drone explosion. Priced very nicely with a lot of premium features, this drone allowed both hobby and professional photographers to buy into the drones phenomenon. This is obviously one of the most popular drones for sale on Amazon for this reason. 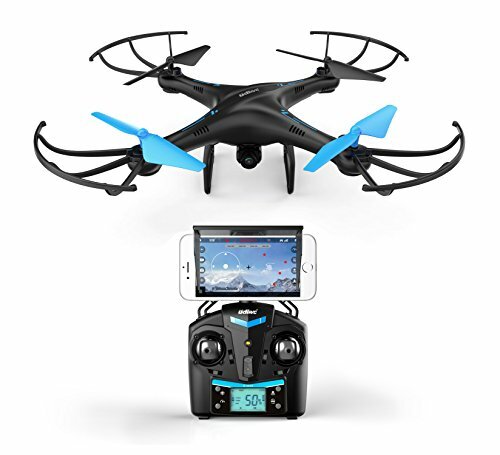 As of at the time of writing, this specific drone has more than 700 reviews with an average rating of 4.5 stars. Simply put, if you’d like to get a drone with plenty of pro and semi-pro video and photo capabilities, without burning a hole in your pocket, the DJI Phantom 3 is the way to go. Have a look at the following customer review of this, the best-selling of Amazon drones with camera. Going into full detail of the capabilities of this drone would require a whole post of it’s own for this best selling Amazon drone, so we’ll stick to a few key features and capabilities. The great thing about this specific seller is that you can buy the drone at the price you prefer. If you just want to buy the basic quadcopter from Amazon, you can. If you want to bundle a bunch of accessories, extra batteries, SD Cards and plenty of other accessories and spares as suits your budget – you can do so too. Next on our list of drones for sale from Amazon is another budget drone. Once again, this is an Amazon’s choice drone – meaning buying this drone is always a great choice. 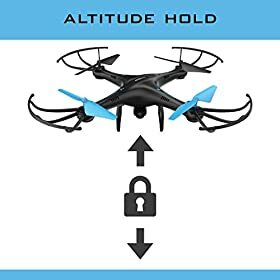 Seeing that this is a budget drone, in fact, it’s less than $50, and is a good first buy, especially for those who are not too familiar with drone technology and gadgets. 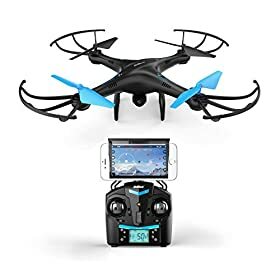 Even more, this drone is great if you are looking for a starter drone for kids – it’s budget price means that you don’t have to worry if your kids crash the drone. 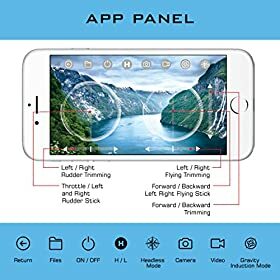 While of course, you’re not going to find extraordinary features in this budget drone with camera from Amazon, there are more than enough features for you learn and get used to flying drones and quadcopters. In fact, we highly recommended the Holy Stone HS170 for drone training. Let’s quickly run through the features of this Amazon choice drone. 1. Headless flight system – While this feels like a very technical term, headless means that this drone does not have a head or a tail, like let’s say, an RC model airplane. The drone orients the quadcopter’s flight to the controller (instead of always on the drone’s “head”, hence headless). This makes it more fun to fly and makes it much easier to learn how to fly and control it. With the above specification for such a ridiculously low price, it’s no wonder that the Holy Stone HS170 Predator has made it to our list of best-selling drones for sale on Amazon. Have a look at this drone on Amazon, the below seller is directly from Holy Stone and fulfilled by Amazon. Besides, DJI, one of the major drone manufacturers is Yuneec – and that’s why we’ve added the Yuneec Q500 4K Typhoon Drone to our list of Amazon drones. We’re now once again in the realm of professional drones, with a drone with a 4K camera, with extremely positive reviews. In fact, the Yuneec Typhoon has a 4.3 out of 5-star rating, making it one of the top-rated drones on Amazon. Have a look at the below 5-star review of the Typhoon. 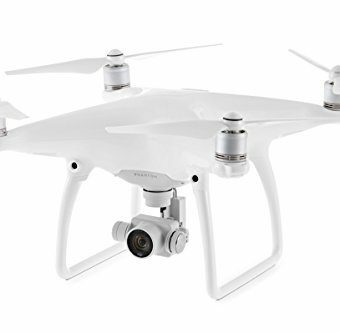 This drone is actually a primary competitor to the DJI Phantom 3 which we’ve also mentioned further above on our list of drones for sale on Amazon. Whilst, a simple section in a list of drones for sale will never do this drone any justice, we’re going to give a shot at trying to highlight the main features of this amazing quadcopter. Personal Ground Station with built-in 5.5inch color touch screen, included with all versions of the Q500, houses all the controls, buttons, and settings necessary for flying and landing the drone, activating its features and capturing photos or videos of what the drones “sees” as it flies besides battery life, altitude, distance from the controller, ground speed, and GPS status, among several others. Integrated 3-axis precision gimbal camera mounted directly underneath the drone, the camera has a 115-degree field of view, 1080p full HD, and 4K ultra-high definition at 30 frames per second. The controller advanced configuration of the camera’s video settings, or else use full automatic settings. It’s time for another best-seller on our list of drones for sale on Amazon. This is in fact, the #1 best-seller in airplane model kits on Amazon! You can’t go wrong with the Force1 U45W Blue Jay drone, it’s a drone which has all the right features, in the right doses, at a price which is very fair. The U45W is actually an upgrade of the extremely popular U45 drone. The upgrade consisted of better VR compatibility and WiFi First Person View! In fact, the U45 Blue Jay is one of UDI’s most tricked out models! This best-selling Amazon drone is lightweight, in a ready-to-fly design, which makes it the perfect choice for both beginner drone pilots and already experienced quadcopter flyers. 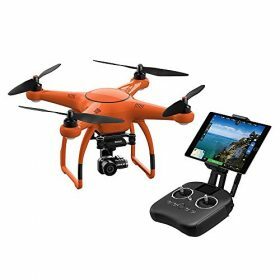 HD Camera – Even though this is a budget drone, it’s still got a high definition 720p 2MP stationary camera, which allows you to capture the highest quality aerial photos and videos. Video footage is captured at a resolution of 1280 × 720 at 30 FPS, which is great for aerial photographers and videographers. Altitude Hold – The U45 has a built-in altitude hold feature which can be activated at the click of a button, which sets the drone to hover at a specified altitude. This feature is priceless when you need to control the drone for stable aerial photography and videography. Headless Mode – The U45 is another headless mode drone, where once activated, the headless mode allows the pilot is to fly the drone without having to worry about which direction the drone is facing. WiFi FPV & VR Headset Compatible – The U45W drone also features WiFi FPV (First Person View) i.e. the ability to view your flight through FPV (first-person view.). VR Headset Compatibility means you can sync a compatible VR headset directly with the controller to really take your drone flight to the next level. Heard enough? Wait, there’s more! At the budget price of just over a $100, we believe that it’s no wonder this is one of the best-selling Amazon drones for sale.See it and buy now directly from USA Toyz, a top Amazon drones supplier. We’re well on our way on our list of top 10 quadcopters for sale on Amazon. Once, again, it’s time for another drone from DJI. With DJI owning about 70% of the drones and quadcopters market share, it’s no wonder they feature multiple times on any of our Amazon drones roundups. We’ve mentioned the Phantom 3 above, and started this amazon drones list with the Mavic – but between these two, is another best-selling drone. It’s the DJI Phantom 4 Drone. If you haven’t seen at least one of these drones in recent months, have you been living under a rock? Just like any good consumer company, DJI listened to feedback it got from consumers about the DJI Phantom 3, and fixed all the stuff in their Phantom 4 version. 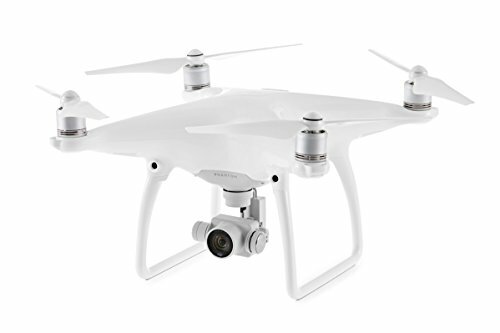 The DJI Phantom 4 is touted as the “smartest flying camera DJI has ever created”. Here are some of the innovative features which came out first on the Phantom 4 quadcopter and which have made the Phantom a must-have drone from Amazon. Obstacle avoidance and intelligent flying over or around obstacles. Thanks to its obstacle sensors, the Phantom 4 can react to its environment and save you the pain of a drone crash. Simply by tapping on the screen, the Phantom 4 in the direction you have tapped. A dual satellite positioning system (outdoors) and an enhanced Vision Positioning System (indoors) makes for a safer, more reliable experience both outdoors and indoors. Powerful Camera with 4K video capturing ability at 30 frames per second and slow motion video at 1080p at 120 frames per second. A 3-axis u-frame active camera stabilization system cancels out any unwanted camera movements during flight to create flawless video and photo. The Phantom 4 has an extended flight of up to 28 minutes on a single charge. The camera’s integrated long-range transmission allows viewing at 720p HD from up to 3.1 miles (5km) away. A dual compass module and dual Inertial Measurement Unit (IMUs) increases the reliability of the drone since both sensors can backup each other. The Phantom 4’s advanced aerodynamics and stability allow for better efficiency in flight. In Sport mode, ideal for drone racing – the Phantom can fly at up to 45mph with satellite and Vision Positioning support. Heard enough? Ready to ship this baby home? Buy safely from the Amazon drones supplier below. 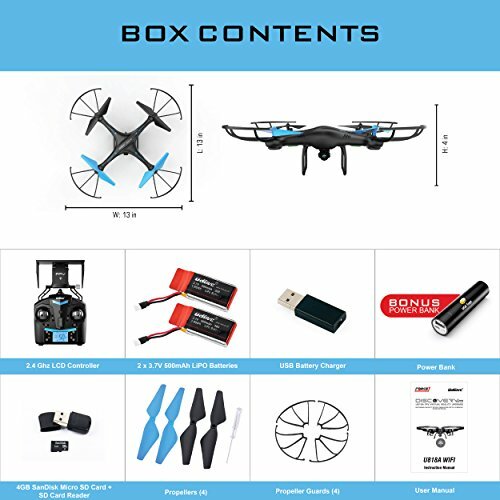 The DBPower MJX X400W budget drone with camera from Amazon is another top-rated and best-selling quadcopter which is a safe purchase if you want to get started in the intoxicating world of drones. Selling for less just $69.99 the MJX X400W still packs a punch and has a multitude of features! Let’s have a quick look at what the X400W Amazon drone can do. 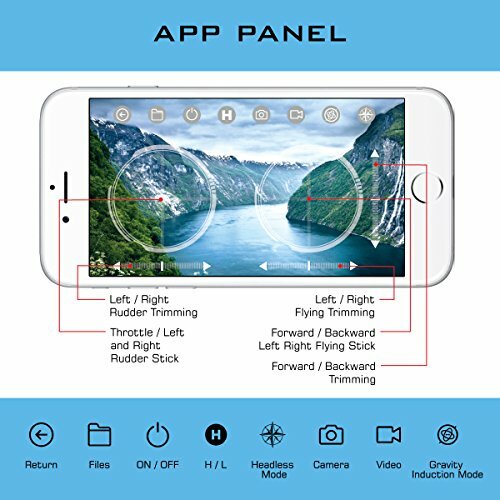 3D Split screen display: Since the X400W is compatible with 3D VR HEADSET using the MJX FPV APP, you can use a VR headset to see exactly the view as if you were in the drone (first person view). This mode is excellent for enticing kids to technology. 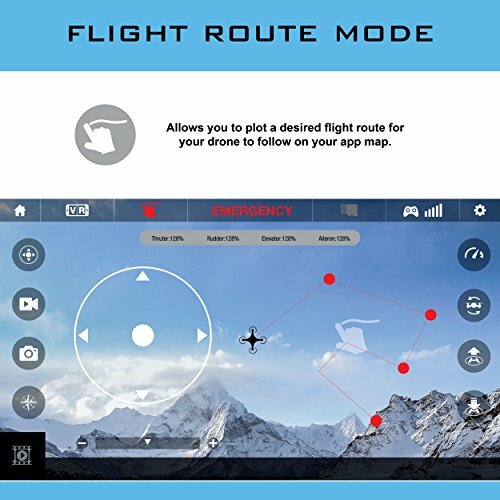 Smartphone integrated Real-time transmission First Person View: By connecting your Android or iPhone with the drone, you will also be able to get the drone’s first person view directly on your phone’s screen. 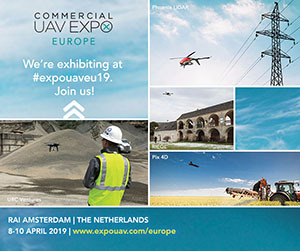 6-Axis gyro control system: the latest control technology of 6-Axis Gyro controller, the drone is very stable, which is great for taking stunning pictures – it is a very easy drone to fly, even for the novice flyer. We’re on our final professional Amazon drone for sale. Since we’ve already covered a number of DJI drones, we’re now about to feature a different manufacturer, Autel Robotics, with their top-rated, best selling drone on Amazon – the X-Star. With a price tag of around $799, this is a mid-range to expensive drone, but of course, at such a price, you’re going to find quadcopter features to match this price. Once again, this Amazon quadcopter has a 4.6 out 5 star rating on a total of 282 customer reviews – as you can see, people are very happy to recommend this drone. It’s often featured on such Amazon drones lists, such as Father’s Day, Christmas and other tech toy gift guides. Let’s have a quick look at the features you can find on this mother. Reliable flight is achieved thanks to Dual GPS/GLONASS outdoor navigation, SecureFlyTM magnetic interference protection, and the Starpoint Positioning SystemTM – with most of the systems being proprietary to Autel Robotics. These few words on this best-selling drone can’t do it any justice. Have a look at the video and much better description directly on Amazon below. We’ve sourced the direct supplier, so you won’t find any better deal on this drone. Ready for our final item on this list of Amazon drones? It’s time for our final best-selling Amazon quadcopter. Our final drones for sale on Amazon is actually a racing drone. Yes, racing drones is a thing. It’s a big thing, which is getting bigger and bigger by the day. It’s where competitors race their drones on a pre-determined course. Using VR headsets to get a First-Person-View of what the drone is seeing, these events are getting ever more popular. So, if you want more from your drone than just taking video and pictures, the Eachine Racer 250 is the perfect racing drone for you. Now, unlike your typical drone for sale, this quadcopter does not look too fancy. In fact, you don’t even have a cover on its internals – all its innards are visible. The idea here is that this drone needs to be as lightweight as possible to make sure this drone is as fast as it can get, without nothing adding any extra weight to it! It’s made from lightweight carbon fiber, with a super anti-fall structure – standard for racing drones. Ready to outgrow your toy and start racing drones with the big guys? Go on, click the Buy Now button – you know you want to! And there you have it! With our list of drones on Amazon, you can rest assured that you’re getting the best deal, from a reputable supplier! But what about you? What’s on your wishlist from all of the available drones for sale on Amazon? Let us know in the comments below. Very informative!!! Thanks for sharing this information about top 10 drones. Thanks for the great review! I’m looking at getting a starter drone for my dad- How do the cheaper models on the list compare to the drone x pro? Thank you!!! Hey Sarah, you get what you pay for in reality. My opinion, is go for a cheapish model first, just so that both you and your dad, see if they actually get into it, then splash out when they’re happy. Of course, the lower end models aren’t going to be as fun as the higher-end models. If he said he likes them and he’s been dying to get one, and you really want to treat him, go for a DJI model, they’re all fantastic gadgets to own!